The Boston Red Sox last won the World Series in 1918. Two years later, they sold the contract of a young pitcher and batter - Babe Ruth - to the New York Yankees. Since then, the Yankees have won 26 World Series titles - while the Red Sox have remained winless. This is why baseball fans worldwide have come to believe in the "Curse of the Bambino." For one collector from Plymouth, Massachusetts, just 40 minutes south of Boston, that curse seems to have had no effect, however. Rick Antoniotti, from America's Hometown, recently pulled one of the more unique and interesting, modern trading cards made for America's Pasttime of baseball. The card features baseball's first slugger, George Herman "Babe" Ruth. "The Sultan of Swat," as he was known, was one of the most talented and well-liked baseball players ever which leads to the enormous interest in Babe Ruth memorabilia and collectibles among sports collectors. 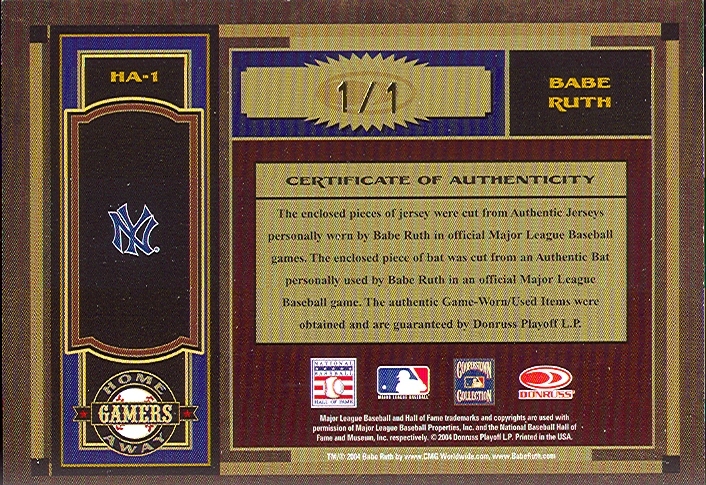 In May 2002, Donruss/Playoff, a manufacturer of sports trading cards, purchased a 1925-era, game-worn Babe Ruth jersey - one of just three Ruth pinstriped home jerseys known to exist - for $264,911 at an auction. 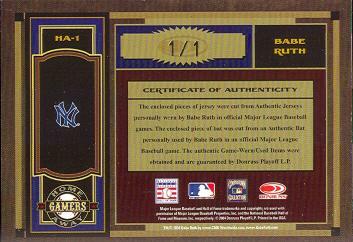 Then in 2003, the company began cutting swatches from the jersey resulting in over 2000 pieces of the Ruth jersey which were to be incorporated into various products over a period of several years. One of those products was 2004 Donruss Timeless Treasures, released earlier this year. The Timeless Treasures set contains a Home and Away Gamers Combos Prime Signatures subset featuring one prime swatch of both home and away game-worn jerseys, one swatch of game-used bat and one autograph sequentially numbered to 5 or less. 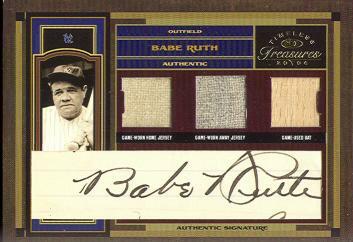 The Babe Ruth version of this card is numbered to 1, resulting in a true one-of-a-kind collectible. When Rick Antoniotti, a collector and hobbyist, purchased two cases of Timeless Treasures from eBay PowerSeller 1-Stop Card Shop on May 3, 2004, he had no idea about the excitement he would soon be generating. At $1159.99 per factory-sealed, 15-tin case, Antoniotti was hoping to add valuable, high-end cards to the growing baseball and football card collection he had built over the last few years. 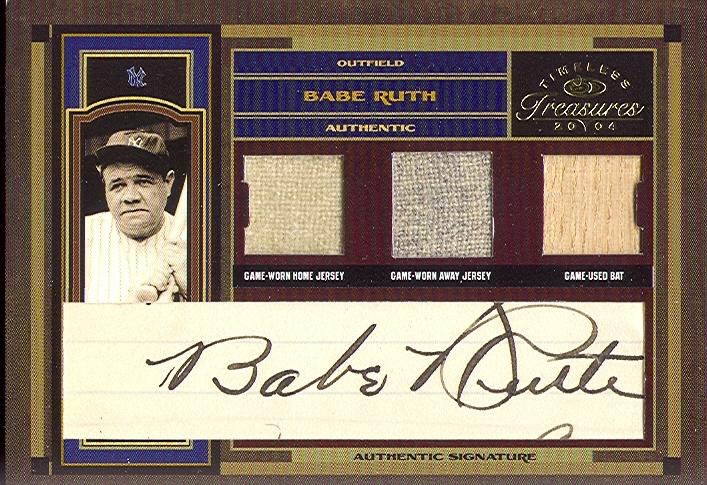 As he began opening tins and packs, he soon pulled the incredible 1/1 Babe Ruth card shown here (click each for larger image). Antoniotti explains, "I realized immediately what I had pulled as I had seen the card in an advertisement." As he began the process of fully understanding what he had just pulled and its potential value, he recalls being "stunned, amazed and shaking for a half hour." Donruss/Playoff Communications Manager Tracy Hackler adds, "For any collector, that card is absolutely the pull of a lifetime. In terms of content and collectibility, it's just a stunning piece of history. We've been delivering some spectacular Babe Ruth pieces throughout much of 2004, but that one might be one of the most splendid. Internally, when we were putting the finishing touches on Donruss Timeless Treasures from a development perspective, there was a tremendous amount of attention and anticipation surrounding that card." Within days of pulling the Babe Ruth card, Antoniotti decided to auction the item on eBay. He explains, "I am not a vintage collector and decided to place the card in an eBay auction so that someone who is a true vintage Babe Ruth collector would have the opportunity to own it." As expected, there are a number of collectors who are welcoming the chance to add this unique card to their collection. Hackler of Donruss/Playoff sums up the interest by saying, "It will be exciting to watch the activity surrounding that card now that it's been pulled." The first eBay auction for the card ended with a final high bid of $24,000. However, the reserve was not met and the card was relisted. Once again though, the second auction ended without meeting the reserve after reaching a high bid of $19,900. The card was then relisted again for a third auction after removing any reserve. The third auction had a high bid of $15,500, but payment has not been made on the card. The next step is undecided at this time. As for Antoniotti, he will continue collecting and has no immediate plans for the earnings from his auction. Since he says, "Unfortunately, this is the most valuable item I have ever had in my collection," one has to wonder what other great pulls may be coming for this Massachusetts collector who has already avoided the "Curse of the Bambino."